Just came back from Taiwan. 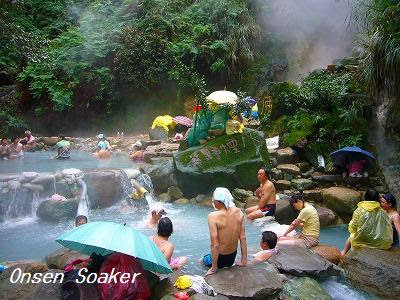 Soaked in various type of hot springs, for example, a wild open-air bath beside a river, a free public bath mainly for local residents, a private bath at a temple, and stylish spa pools. 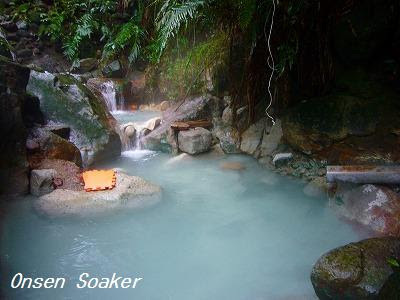 The most memorable was the Ba Ian Hot Spring(八煙野渓温泉) just outside of Taipei city. The sulfur hot spring is very hot, more than 50 degrees Celsius, but you can make it adequate temperature by mixing river water. To visit there, get on the Royal Bus(皇家客運汽車) serving between south side of Taipei railway station and Jinshan, and after about an hour and half ride, get off at Ba Ian Hotspring Resort(八煙温泉會館). Takes not more than 30 minutes on foot to reach this wonderful open-air bath from the bus stop. Swim suites necessary. If you like hot springs in wild settings, this is the place to go. Everyday many people visit there, and the foot pass is well marked. You don't have to worry about get lost. Gets crowded on weekends even it rains. The Royal bus(皇家客運汽車) to Jinshan(金山) leaves from Gong Yuang Rd(公園路), south of Taipei Railway Station. The bus departs about every hour on weekdays, and every half hour on weekends. It takes an hour and half to Ba Ian Hotspring Resort(八煙温泉會館), costing TWD 120 or 130. Walk down the slope beside the bus stop, then not turn right to the entrance of the resort, but go straight to follow unpaved foot pass. Today I went to that place, it's very nice, but they close that place and you risk a penalty. But still many peoples go there!